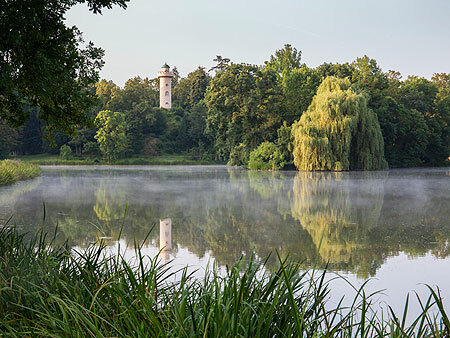 Schönbusch Park is one of the earliest landscape gardens in South Germany. Originating as the electoral game park, it was transformed at the instigation of the Archbishop and Elector of Mainz, Friedrich Karl von Erthal, under the direction of minister of state Graf Wilhelm von Sickingen and the architect Emanuel d'Herigoyen. From 1775, artificial lakes and water courses and hills were created and a winding belt walk was laid out. By 1788/79, in addition to Schönbusch Palace, picturesque rural features in the form of the farm building, the shepherds' cottages and the little village had been created as well as the Temple of Friendship, the Philosophers' House, the observation tower, the dining hall and the Red Bridge. Friedrich Ludwig von Sckell was brought in at the latest from 1783 to complete the garden. It was his first opportunity to apply to a new park the principles of landscape garden design that he had learned in England. 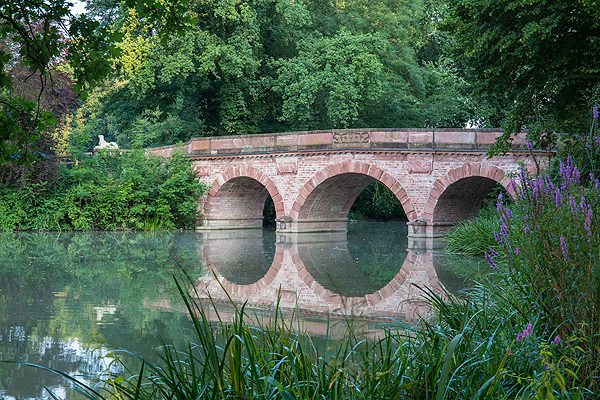 In the process he created one of the most important landscape gardens in Germany. Since 2001 the kitchen building has housed a visitor centre, its main focus being the exhibition "Everything appears natural". The banqueting hall is suitable for concerts, lectures and cultural events up to 134 persons. The ballroom is suitable for banquets up to 60 persons. The orangery is suitable for concerts, lectures, exhibitions and receptions up to 75 persons. For groups it is possible to book guided tours in English and French on the exhibition and the garden (telephone booking required).